If you’re considering upgrading to LED museum lights, you’re in good company. The Smithsonian, Nelson Atkins Museum of Art, German Film Museum, and South Florida Museum have all upgraded to LED lights in order to save money and preserve the art. Even the Sistine Chapel is using 7,000 LED lights to mimic natural light and protect the frescoes from further fading. Museums are upgrading to LED lighting in part because they use less electricity and therefore cost less to operate. After changing out over 5,000 lights in 140 galleries, the Minneapolis Institute of Arts became the first museum of its size to have 100% LED lighting in its galleries. This is saving an astonishing $149,000 a year in electric bills, but that’s not the only improvement. “The new lights improve the depth of the artwork, making it look crisp and detailed, especially bringing out greens, blues and purples,” says Charles Walbridge, photographer for the Minneapolis Institute of Arts. LED lights also have a longer lifespan, averaging 20,000 hours compared to 10,000 hours for CFLs and 1,000 hours for incandescents. Minneapolis Institute of Arts Gallery. Image from Xcel Energy case study. When LEDs were first introduced, you could only get them in a high color temperature, meaning they gave off a cool blue glow rather than the warm yellow glow of incandescents. That is no longer the case. Warm white and cool white LED fixtures can be used to replace existing fixtures with similar color temperatures so that the colors of the artwork aren’t distorted. Experts from the Vatican and OSRAM-SYLVANIA specified a color temperature of 3,500 Kelvin for the Sistine Chapel, but you will want to test out different color temperatures for different exhibits to see what works best. Are LED Lights Safe for Artwork? You may have read the article claiming that “LED lights may be bad for Van Gogh paintings” following a study by the University of Antwerp in 2013. Scientists studied the discoloration of yellow pigments when exposed to different illumination after the yellow pigments in Van Gogh paintings started turning brown. The research made international headlines when an article in The Independent claimed that “Van Gogh's masterpiece is slowly turning brown as a result of exposure to LED lighting” even though researchers never exposed the pigments to light from an LED bulb. Instead, they used a high-intensity Xenon lamp with wavelength filters. While the blue filter did brown the pigment more than the red filter, the spectrum given off by the xenon lamp is not comparable to typical cool white LEDs and the paint was exposed to 1000 times the values used in conventional illumination. California-based LED manufacturer Soraa stepped in to shed some light on the debate. “It is very plausible that the degradation observed by the researchers at University of Antwerp is caused by UV-A light leaking through the ‘blue’ filter,” said Soraa’s press release. Over exposure to any light can cause irreversible damage to artwork; even light in the visible spectrum can cause fading, yellowing, and embrittlement. Rotating exhibitions to limit the amount of light a piece of art is exposed to is one of the best ways to preserve the artwork. Karen Colby of the Montreal Museum of Art recommends a maximum exposure of 12,000 lux/hours per year for the most light-sensitive materials. However, for permanent installations, the light fixture producing the light is important for preservation. 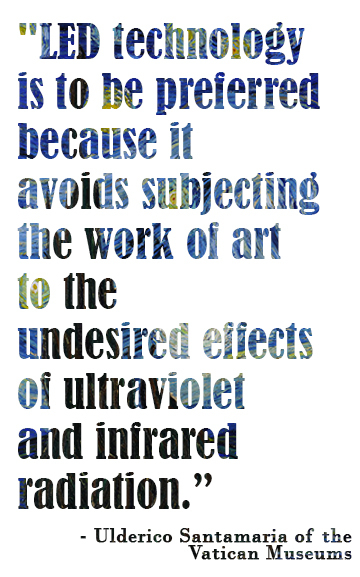 According to the National Gallery of Art, the primary sources of light exposure damage are infrared (IR) and ultraviolet (UV). Because compact fluorescent light bulbs (CFL bulbs) emit UV radiation, museums use glass filters to protect the artwork. “LED technology is to be preferred because it avoids subjecting the work of art [to] the undesired effects of ultraviolet and infrared radiation,” said Ulderico Santamaria, Head of the Diagnostics Laboratory for Conservation and Restoration at the Vatican Museums. The American Institute for Conservation of Historic & Artistic Works (AIC) concluded that LEDs in the 2700K-4000K color temperature are “safe if used at an appropriate light level for museum applications.” AIC also found LEDs to have less damage potential than UV filtered halogen bulbs and UV filtered natural sunlight, which is one reason the Sistine Chapel decided to change from natural light to artificial light. Image from GE case study. In addition to protecting classic works of art, LED lights shine down on classic cars in the Blackhawk Automotive Museum. Upgraded in 2014 to improve light quality and reduce operating costs, the Blackhawk Automotive Museum replaced 970 halogen lamps with LEDs from GE for an anticipated 77% reduction in energy usage, a savings of over $25,000 annually. “The cars just ‘pop’ now with the new LED lighting! The vibrancy of the different paint colors really stands out and visitors have even been commenting on how great they look,” said Timothy McGrane, Executive Director of Blackhawk Automotive Museum. Whether lighting irreplaceable classics or something more modern, LED museum lights are a cost-saving upgrade you don’t want to miss. 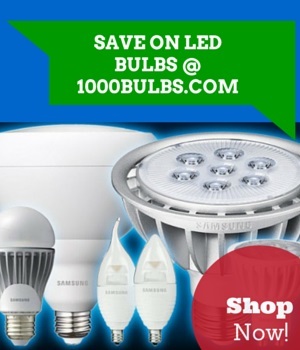 Start shopping for LED light bulbs and retrofit fixtures or contact us for more information. Our team is available to help find the right replacement bulbs for any application. If you don’t work in a museum, you can still light your artwork like a pro. Check out these tips for lighting artwork to learn which light bulbs you should use for oil paintings, water colors, family photos, and more. Want to know more? Ask us questions or leave suggestions for future posts in the comments section below or on Facebook, Twitter, Google Plus, LinkedIn, and Pinterest.